The HMC517LC4 chip is a high dynamic range GaAs PHEMT MMIC Low Noise Amplifier (LNA) housed in a leadless Pb free RoHS compliant SMT package. The HMC517LC4 provides 19 dB of small signal gain, 2.5 dB of noise figure and has an output IP3 of +23 dBm. 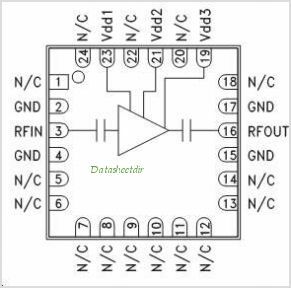 The P1dB output power of +13 dBm enables the LNA to also function as a LO driver for balanced, I/Q or image reject mixers. The HMC517LC4 allows the use of surface mount manufacturing techniques. This is one package pinout of HMC517LC4,If you need more pinouts please download HMC517LC4's pdf datasheet. 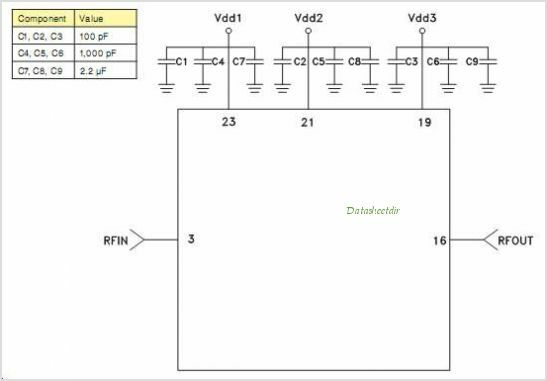 This is one application circuit of HMC517LC4,If you need more circuits,please download HMC517LC4's pdf datasheet.